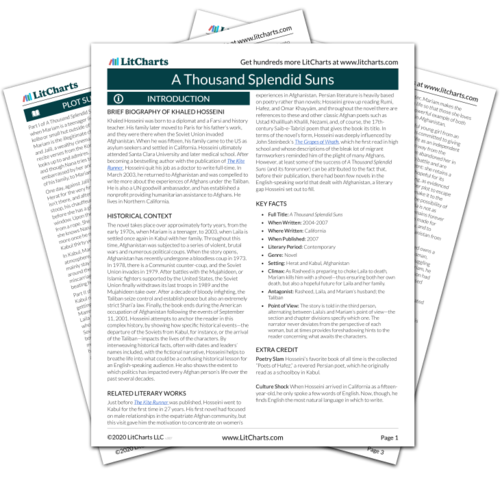 Welcome to the LitCharts study guide on Khaled Hosseini's A Thousand Splendid Suns. Created by the original team behind SparkNotes, LitCharts are the world's best literature guides. A concise biography of Khaled Hosseini plus historical and literary context for A Thousand Splendid Suns. A quick-reference summary: A Thousand Splendid Suns on a single page. In-depth summary and analysis of every chapter of A Thousand Splendid Suns. Visual theme-tracking, too. Explanations, analysis, and visualizations of A Thousand Splendid Suns's themes. A Thousand Splendid Suns's important quotes, sortable by theme, character, or chapter. Description, analysis, and timelines for A Thousand Splendid Suns's characters. Explanations of A Thousand Splendid Suns's symbols, and tracking of where they appear. An interactive data visualization of A Thousand Splendid Suns's plot and themes. Khaled Hosseini was born to a diplomat and a Farsi and history teacher. His family later moved to Paris for his father’s work, and they were there when the Soviet Union invaded Afghanistan. When he was fifteen, his family came to the US as asylum seekers and settled in California. Hosseini ultimately attended Santa Clara University and later medical school. After becoming a bestselling author with the publication of The Kite Runner, Hosseini quit his job as a doctor to write full-time. In March 2003, he returned to Afghanistan and was compelled to write more about the experiences of Afghans under the Taliban. He is also a UN goodwill ambassador, and has established a nonprofit providing humanitarian assistance to Afghans. He lives in Northern California. The novel takes place over approximately forty years, from the early 1970s, when Mariam is a teenager, to 2003, when Laila is settled once again in Kabul with her family. Throughout this time, Afghanistan was subjected to a series of violent, brutal wars and numerous political coups. When the story opens, Afghanistan has recently undergone a bloodless coup in 1973. In 1978, there is a Communist counter-coup, and the Soviet Union invades in 1979. After battles with the Mujahideen, or Islamic fighters supported by the United States, the Soviet Union finally withdraws its last troops in 1989 and the Mujahideen take over. After a decade of bloody infighting, the Taliban seize control and establish peace but also an extremely strict Shari’a law. Finally, the book ends during the American occupation of Afghanistan following the events of September 11, 2001. Hosseini attempts to anchor the reader in this complex history, by showing how specific historical events—the departure of the Soviets from Kabul, for instance, or the arrival of the Taliban—impacts the lives of the characters. By interweaving historical facts, often with dates and leaders’ names included, with the fictional narrative, Hosseini helps to breathe life into what could be a confusing historical lesson for an English-speaking audience. He also shows the extent to which politics has impacted every Afghan person’s life over the past several decades. Just before The Kite Runner was published, Hosseini went to Kabul for the first time in 27 years. His first novel had focused on male relationships in the expatriate Afghan community, but this visit gave him the motivation to concentrate on women’s experiences in Afghanistan. Persian literature is heavily based on poetry rather than novels; Hosseini grew up reading Rumi, Hafez, and Omar Khayyám, and throughout the novel there are references to these and other classic Afghan poets such as Ustad Khalilluah Khalili, Nezami, and, of course, the 17th-century Saib-e-Tabrizi poem that gives the book its title. In terms of the novel’s form, Hosseini was deeply influenced by John Steinbeck’s The Grapes of Wrath, which he first read in high school and whose descriptions of the bleak lot of migrant farmworkers reminded him of the plight of many Afghans. However, at least some of the success of A Thousand Splendid Suns (and its forerunner) can be attributed to the fact that, before their publication, there had been few novels in the English-speaking world that dealt with Afghanistan, a literary gap Hosseini set out to fill. Climax: As Rasheed is preparing to choke Laila to death, Mariam kills him with a shovel—thus ensuring both her own death, but also a hopeful future for Laila and her family. Point of View: The story is told in the third person, alternating between Laila’s and Mariam’s point of view—the section and chapter divisions specify which one. The narrator never deviates from the perspective of each woman, but at times provides foreshadowing hints to the reader concerning what awaits the characters. Poetry Slam Hosseini’s favorite book of all time is the collected “Poets of Hafez,” a revered Persian poet, which he originally read as a schoolboy in Kabul. Culture Shock When Hosseini arrived in California as a fifteen-year-old, he only spoke a few words of English. Now, though, he finds English the most natural language in which to write. Baena, Victoria. "A Thousand Splendid Suns." LitCharts. LitCharts LLC, 28 Jul 2015. Web. 23 Apr 2019. Baena, Victoria. "A Thousand Splendid Suns." LitCharts LLC, July 28, 2015. Retrieved April 23, 2019. https://www.litcharts.com/lit/a-thousand-splendid-suns.